Log, approve, and analyse all employee absence. People genuinely get sick, but how do you know if there are underlying issues? Without effective absence tracking you won’t spot problems or trends. 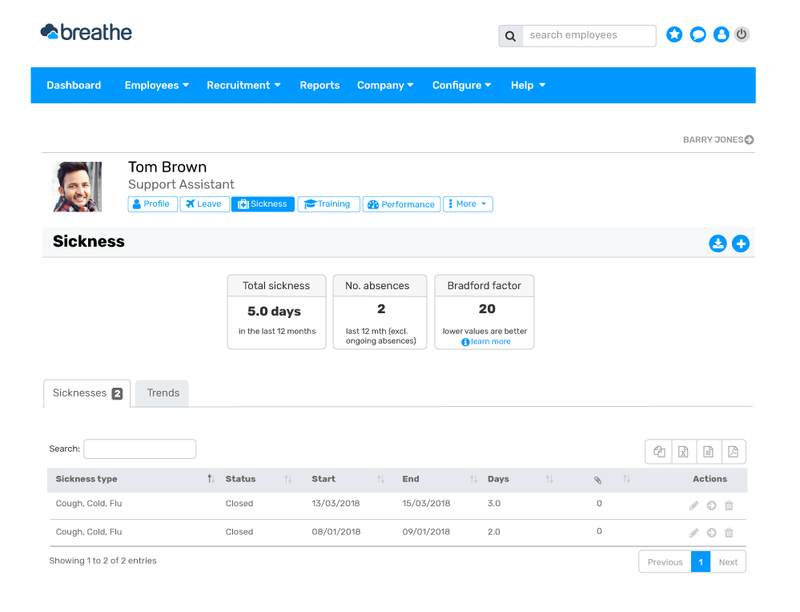 Breathe helps you take control and manage sickness absence with simple and cost saving features. What is sickness monitoring software? Sickness monitoring software is much more than a simple recording tool. It helps managers to quantify, monitor and manage sick leave. 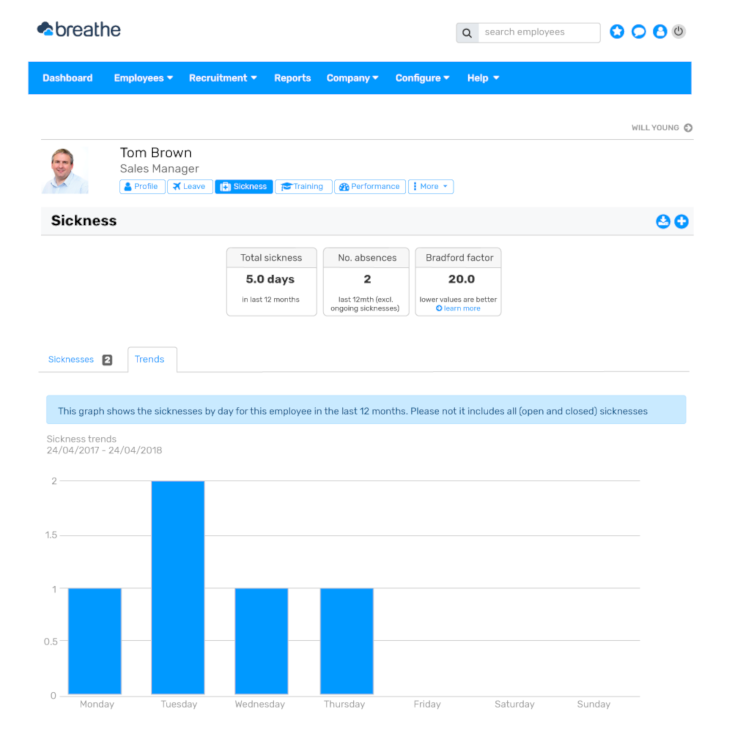 Breathe’s comprehensive sickness monitoring software keeps all uploaded sick notes and back-to-work documents in one place, and provides in-depth reports and automatic Bradford factor calculations. With sickness absence software you can identify patterns of illness, nip potential absence problems in the bud, support staff getting back to work, and take steps to reduce staff absence. Accurate, timely and accessible information is the key to controlling sickness absence and effectively plan staffing levels. HR and line managers can approve or even submit absences into the system after receiving word from an unwell employee. 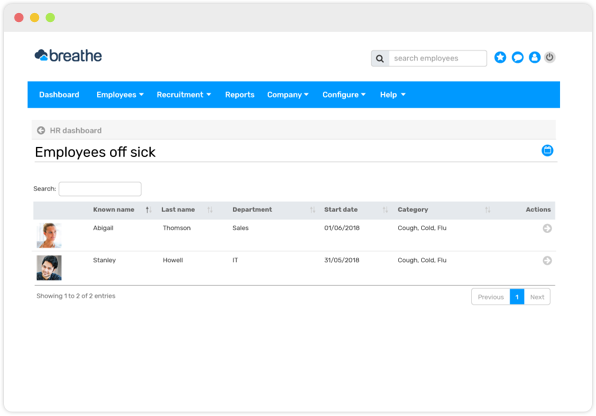 The HR and Manager dashboards makes it easy to see who has reported sickness, approve sickness, and see who is off sick for the day. Each employee profile contains detailed information about any absences. 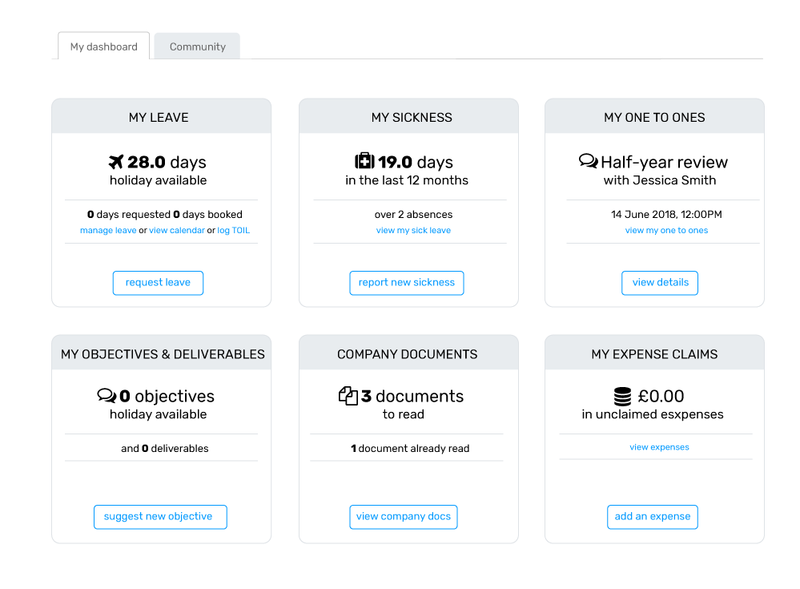 With a quick overview of the last 12 months, each profile displays the number of days absent and you can view details of each absence with just the click of a button. Breathe also provides a Bradford Factor score for each employee giving you the opportunity to spot frequent and short periods of illness. Employee absence comes with a significant cost to business. With the Breathe easy to use management reports, you’ll be able to easily spot problems before they develop. Identifying sickness absence trends is almost impossible with a combination of spreadsheets and paperwork. Generating reports on Breathe is simple, so you’ll have your finger on the pulse and spot trends in an instant. Monitoring and managing employee sickness absence efficiently and effectively enables you to keep the focus on employee wellness. Breathe's system supports better communication within your business and enables you to give your employees the support they need. Transparent and easily accessible information on your sickness policies makes sure everyone in your business is on the same page. "User-friendly, great support team, suits our SME."